Finlay Motor Group opened our fantastic new facility on the M7 Motor park in Naas in 2008. Finlay Motor Group have been serving the motorists of Kildare and surrounding counties since 1936. 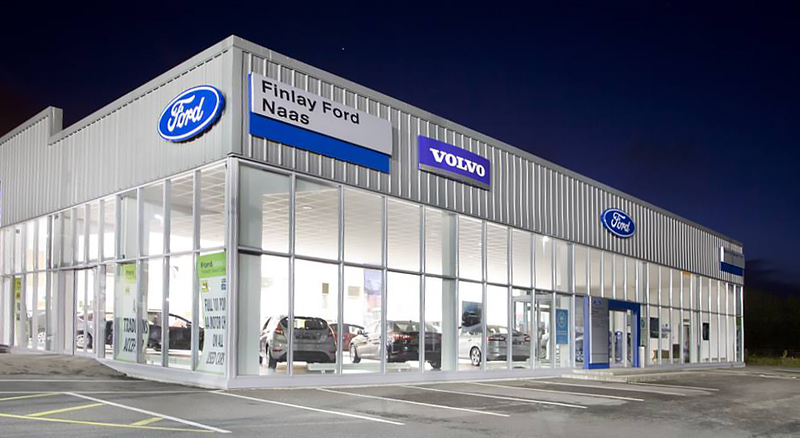 Finlay Ford is located in a prime location for all parts of Leinster and is less than 30km from Red Cow in Dublin. With an acre of floor space this premises includes a 14 bay workshop equipped to the highest standards, a new car showroom for up to 20 vehicles, a used car showroom and Ireland's only dedicated Horsebox showroom. Customers can avail of ample parking, comfortable waiting area, refreshments and free Wi-Fi. The Finlay Family has been proudly serving the motorists of Kildare and surrounding counties since 1936. In 2011 we celebrate our 75th successful year in business. Since acquiring the Ford franchise in 1987 our business has gone from strength to strength with a strong customer base in Kildare and Dublin. Our emphasis on After Sales Service sets us apart from other dealers. It is our commitment to our customers after the purchase that, we believe, is the key to our success. This has lead to strong customer loyalty and repeat business. Finlay Ford: Appointed main Ford Dealers in Kildare in 1987 we have consistently been one of Irelands top performing Ford dealers for more than 20 years. We provide the complete Ford package including new Ford cars and commercial vehicles, Ford parts and accessories and can carry out all repairs and maintenance required by Ford customers. Finlay Equi-Trek: Kildare and the horse industry go hand-in-hand and the Finlay family have had associations with both show jumping and horse racing. Therefore the addition of the Equi-Trek franchise to the Finlay Group made perfect sense. As sole agents for Ireland and Northern Ireland we provide the full range of Equi-Trek horse box trailers and trucks.